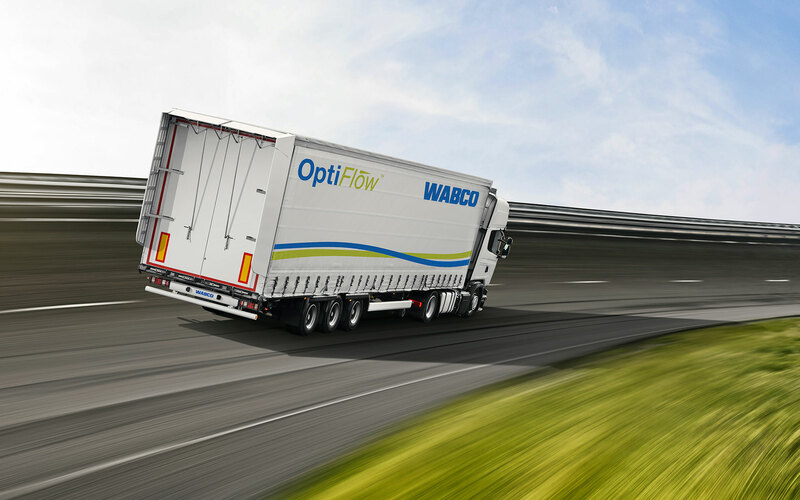 WABCO OptiFlow™ Tail is a refreshingly innovative, modular system that radically improves aerodynamic drag at the rear of trailers. 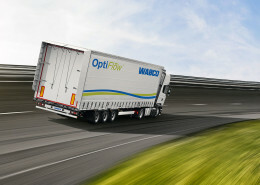 WABCO OptiFlow™ Tail reduces rear-end drag better than any other 50 cm tail in Europe. 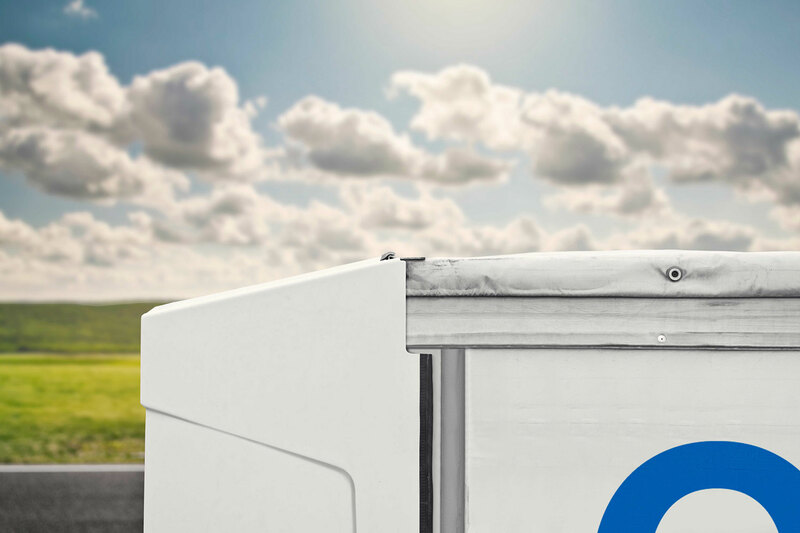 Rigorous tests show clearly why it pays to install OptiFlow™ Tail: it saves up to 1.1 l per 100 km at highway speeds, while reducing CO2 emissions by up to 2.8 tons per trailer per year. How to use OptiFlow™ Tail? 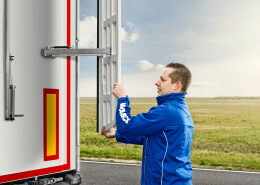 OptiFlow™ Tail consists of lightweight, robust modular panels which fit all rear swing door trailers. As the OptiFlow™ Tail only needs a few fixing points for mounting, it can be installed on new vehicles or retrofitted to existing trailers. Fast to deploy and fast to fold – minimizing operator delays. Straightforward, reliable operation – the two side panels manually pivot into place and the top panel is operated by a simple lever. The side panels fold towards the trailer’s centre line – leaving plenty of room to open the rear doors to a generous angle of 260 degrees, enabling easy docking with narrow ramps and traffic aisles. Each side panel operates independently – enabling the trailer doors to operate independently. It fits like a glove. 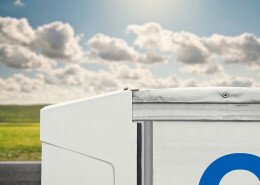 The smooth, aerodynamic alignment between the trailer sides and the OptiFlow™ Tail panels, with no offset at the top, means that there is an even lower air resistance – ensuring a more efficient ride. Visit the OptiFlow™ Micro-site for the complete portfolio of OptiFlow™ products and the latest news in Aerodynamics. 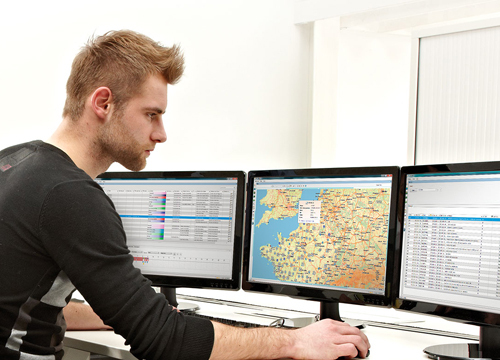 You can now combine all driver, truck and trailer information into one single back office platform, TX-CONNECT. Its extensive reports visualize the effects of OptiFlow™ Tail on fuel consumption and, therefore, CO2 emission. Let us show you how OptiFlow™ Tail can benefit your company. Just give us a call or complete the contact form.